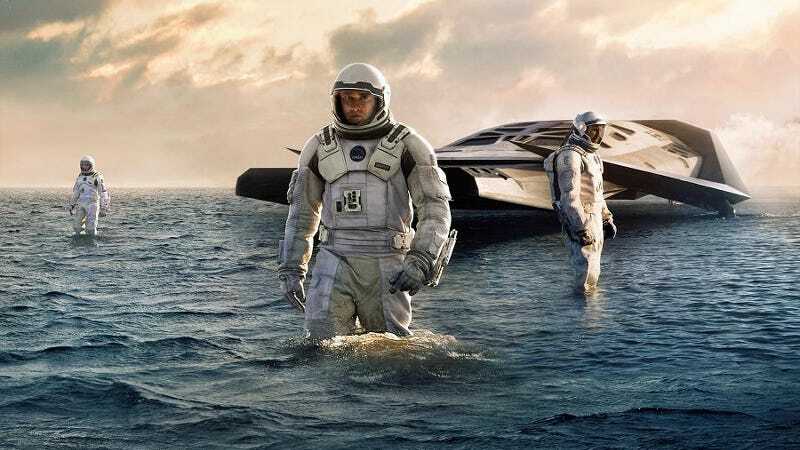 Is Proxima b like the water world featured in Interstellar? At a distance of 4.2 light years, Proxima b is the closest potentially habitable Earth-like planet outside our solar system. New research suggests this distant orb could be completely covered in water. So when do we go? This past August, scientists with the European Southern Observatory (ESO) confirmed the discovery of a rocky planet in the habitable zone of Proxima Centauri—our nearest neighboring star. Little is known about this distant planet and whether it has what it takes to foster alien life, but a new study accepted for publication in the Astrophysical Journal posits the suggestion that Proxima b is covered with oceans, and possibly even a single massive ocean that envelops the entire planet. Proxima b is a fascinating target for study, and not just because it’s an Earth-like planet in the star system nearest to our sun. The planet has a mass around 1.3 times that of Earth, and it sits in a tight orbit approximately a tenth the distance of Mercury to the sun. That’s not necessarily a problem because Proxima b’s host star, Proxima Centauri, is about 1,000 times weaker than our sun. That places it within the habitable zone, where liquid water can reside at the surface. Observations of Proxima b are few and far between, so Bastien Brugger and his colleagues from Marseille University in France ran a series of simulations to get a better sense of the planet’s composition and radius. Their estimates show that Proxima b’s radius ranges somewhere between 0.94 and 1.4 times that of Earth, which is about 3,900 miles (6,300 km) on average. If the planet’s radius is closer to the lower bound of the estimate, it should be very dense, with a metallic core making up a whopping two-thirds of the planet’s entire mass, and surrounded by a rocky mantle. Any surface water on this planet would contribute to about 0.05 percent of the planet’s total mass, which is comparable to Earth’s 0.02 percent. Vast ocean ranges could very well exist on Proxima b. But if the planet’s radius is closer to the higher estimate, around 5,540 miles (8,920 km), things get even more interesting. In this scenario, the planet’s mass would be split evenly between a rocky center and surrounding water. It’s easy to get excited about this result, but we need to learn a lot more about this planet before we jump to conclusions. The researchers based their models on the assumption that Proxima b harbors a thin atmosphere—but we actually don’t know what kind of atmosphere this planet has, or if it even has one. For all we know, it’s a frigid and airless chunk of rock—and not anything that would remotely resemble a habitable planet. But one thing’s for sure, Proxima b is turning out to be the most interesting—and alluring—planet outside of our solar system.